Princess Cruises has introduced The Salty Dog Gastropub to the fleet and the first ship to have the new venue is Crown Princess. The new venue first on Crown Princess will offer a menu with great pub dishes along with beers and whiskey. Presented within the Wheelhouse Bar nightly, in refreshed surroundings and live entertainment, guests will choose three small plates from The Salty Dog Gastropub menu featuring new twists on classic pub dishes. Plates include Pale Ale Pork Cheeks, Spicy Stout Short Ribs, Wild Mushroom Saute, and Lobster Mac & Cheese, among other delicious options. 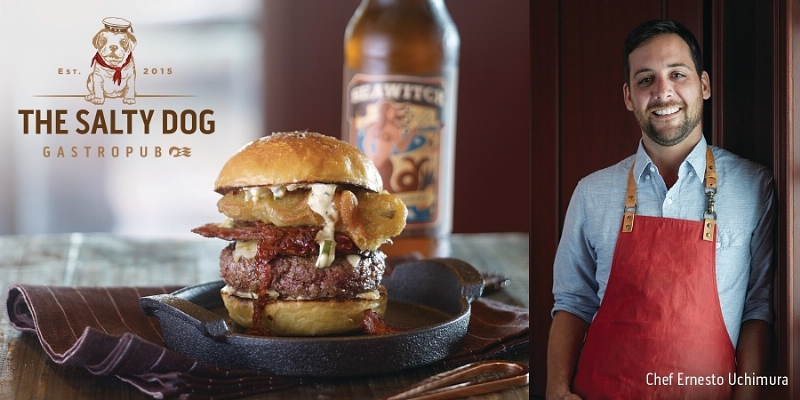 The piece de resistance is “The Ernesto” burger from Chef Uchimura – rib eye and short rib beef patty, grilled pork belly, caramelized kimchi, beer battered jalapeno, charred onion aioli, topped with cave aged gruyere cheese. Adjacent to The Salty Dog Gastropub, also in the Wheelhouse Bar, is an expansive new, international whiskey bar menu, featuring some of the best Scotch whiskeys, American Bourbons and international whiskeys from areas including Japan, Ireland and Australia. Offerings include Johnny Walker Blue, Bakery Hill Classic (Australia), Connemara Whiskey Irish Cask (Ireland) and Hakushu 12 year (Japan). The menu offers daily specialized whiskey flights, allowing guests the opportunity to taste and compare selections around the world. The Salty Dog Gastropub and new international whiskey menu, both available in the Wheelhouse Bar, have just launched aboard Crown Princess, and will be onboard Emerald Princess and Ruby Princess in mid-December. A food charge of $19 per guest applies. The whiskey menu will also be available in the Wheelhouse Bar aboard Dawn Princess, Sea Princess, Sun Princess, Diamond Princess and Golden Princess by the end of 2015, and aboard all ships with the exception of Pacific Princess by the summer of 2016.